In order to meet the requirements of access control, identity authentication, configuration management and permissions management etc., FISCO BCOS will deploy a set of powerful, flexible, and custom-defined smart contracts during the network initialization, collectively referred to as system contracts. The system contract is deployed by administrator during initialization. For redeploying any changes or upgrades while the network is running, it is necessary for the blockchain administrator to get an agreement of all the nodes within the network. 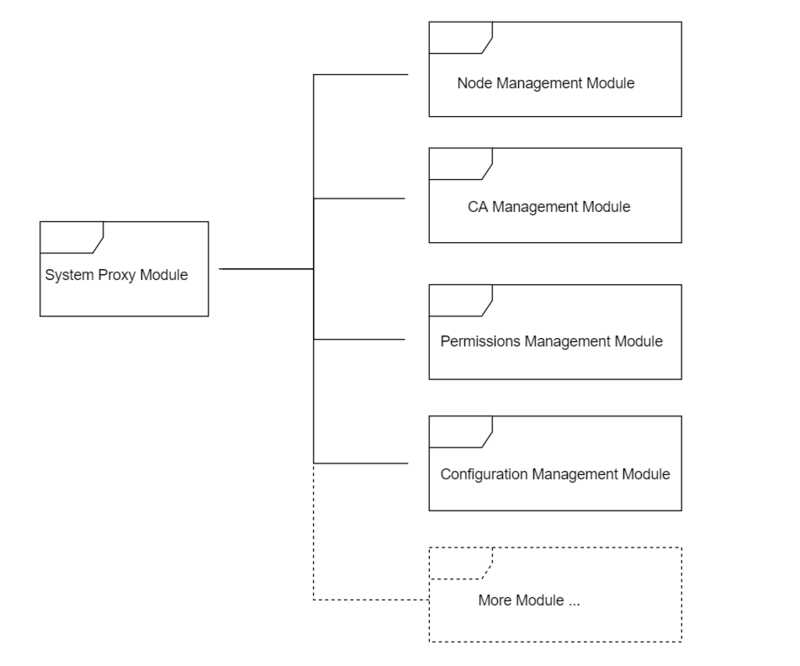 NodeAction.sol is the implementation contract of the node management module. It implements the function of registering, managing and maintaining the list information of all nodes in the network. Every time a node in the network joins or quits, it must controlled by the node management contract. Three node types: Core, Full, and Light. CAAction.sol is the implementation contract of the CA management module. It provides nodes’ certificate registration, management and maintenance. Node joins or quits the chain must controlled by CA management contract if certificate verification enabled. Permissions management’s design principles: 1, One external account only belongs to one role. 2, One role only has one permission list. 3, Permission is identified by a combination of function and its contract address. Permission module are comprised of 4 contracts: TransactionFilterChain.sol, TransactionFilterBase.sol, AuthorityFilter.sol, Group.sol. TransactionFilterChain.sol, the implementation of Filter pattern, provides a unified function ‘process’ for permission checking. It holds an address list of Filter contract which extends from TransactionFilterBase. All permissions will be checked by the calling ‘process’ function of each Filter contract sequentially. All Filters must implement TransactionFilterBase’s ‘process’ interface, AuthorityFilter is inherited from TransactionFilterBase’s role permission Filter implementation. Its process interface implements the checking logic for the permissions of the user role groups. Group.sol handles the concept of Role. It internally maintains the mapping flag for all permission entries for this role. ConfigAction.sol is the implementation of configuration management module for entire network. It maintains configurable information for the entire network in the FISCO BCOS blockchain. The configuration information is kept consistent through out the entire network by transactions broadcast. In principle, only the blockchain administrator can issue transactions broadcast to perform network-wide configuration changes. Implement ‘set’ and ‘get’ based on business requirement. Deploy business contract and get contract address. Call the ‘setRoute’ method in SystemProxy to register contract address in the routing table. Business smart contract is now ready to be called. Call the ‘getRoute’ method in SystemProxy to get the contract address. Get configured information by calling the ‘get’ method with address in step 1. Create a Filter permission contract by inheriting TransactionFilterBase. The custom permissions verification logic should be implemented into the ‘process’ interface as per the business requirements. Deploy custom permission contract and get contract address. Call the ‘getRoute’ method in SystemProxy to get contract address of TransactionFilterChain. Register custom filter contract by calling ‘addFilter’ method in TransactionFilterChain. The contract is now ready for calling. © Copyright © 2018. All rights reserved. Revision 69c72ae3.